To stay up to date on upcoming ABQ events, sign up for the local newsletter! This month we welcome an incredible woman who not only owns and operates a craft brewery, she has also crafted a community of artists and activists through the social outreach and causes that Tractor Brewing supports. 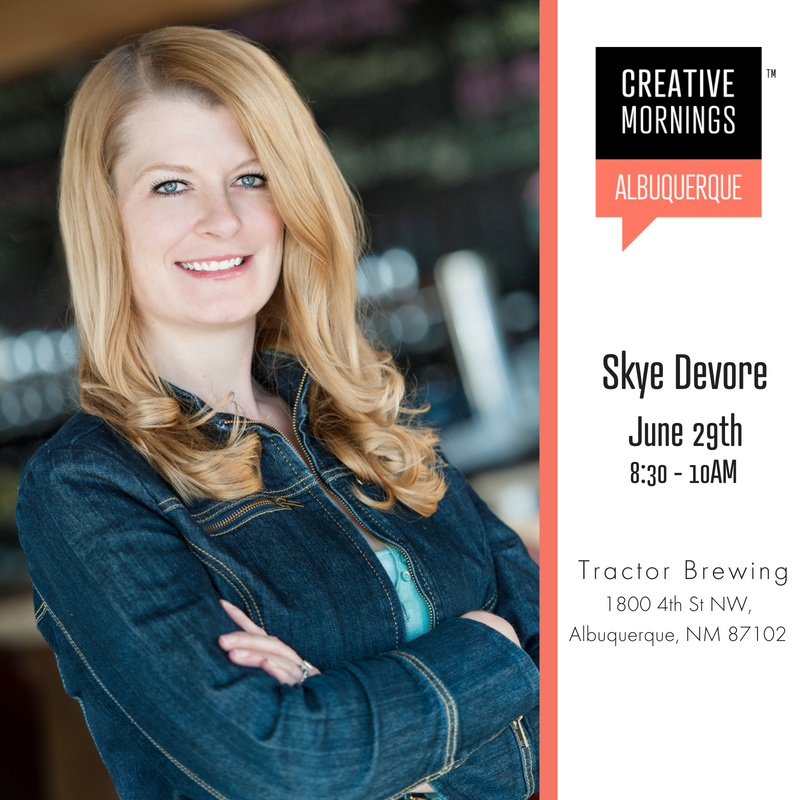 Join us June 29th at Tractor Brewing - Wells Park for Beer Goddess Skye Devore. A commitment is a promise to show up whether you’re having a good or bad day. It’s a behavior and mindset that signifies the posture of a professional. It’s about saying yes with your whole heart.This May we welcome Adrian Carver who has committed to creating opportunities for everyone through his work at Equality New Mexico, the largest and oldest LGBTQ+ political advocacy organization in the state. Wonder what NM politicians support equality? EQNM has you covered. Plus they make some rad rainbow graphics and we are envious. We will also have a special visit from Mayor Tim Keller who will stop in to hold “office hours” and wants to hear from YOU - the creative community. 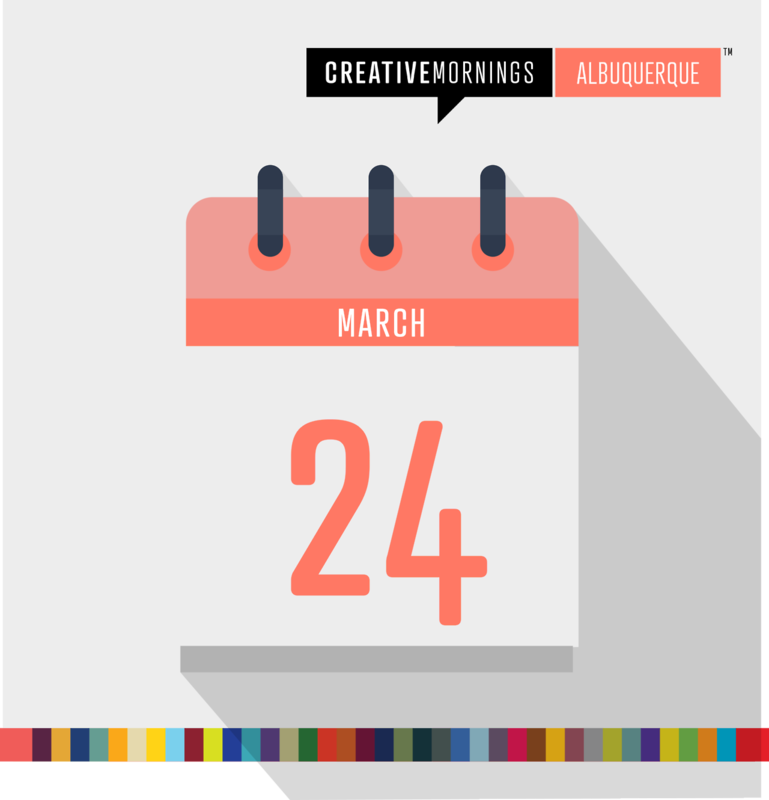 You constantly wow us with the cool you bring to ABQ, and now you can share your thoughts on how our new administration can support making ABQ the best place for creatives to call home.As always free, but please RSVP so we know how much coffee to brew! In April we are doing something a little different. We are heading to Gruet for a tour, tasting and talk. Sofian Himeur, winemaker and grandson to late founder, patriarch Gilbert Gruet is going to share a little about his story and how the family went above and beyond expectations in the making of our favorite local bubbly. New Mexico liquor laws prevent us from free glasses of champagne, but Gruet is generously providing us a tour, talk and glass for only $5. Spring evening + champagne = winning! Save the Date! Next #CMABQ March 24th. 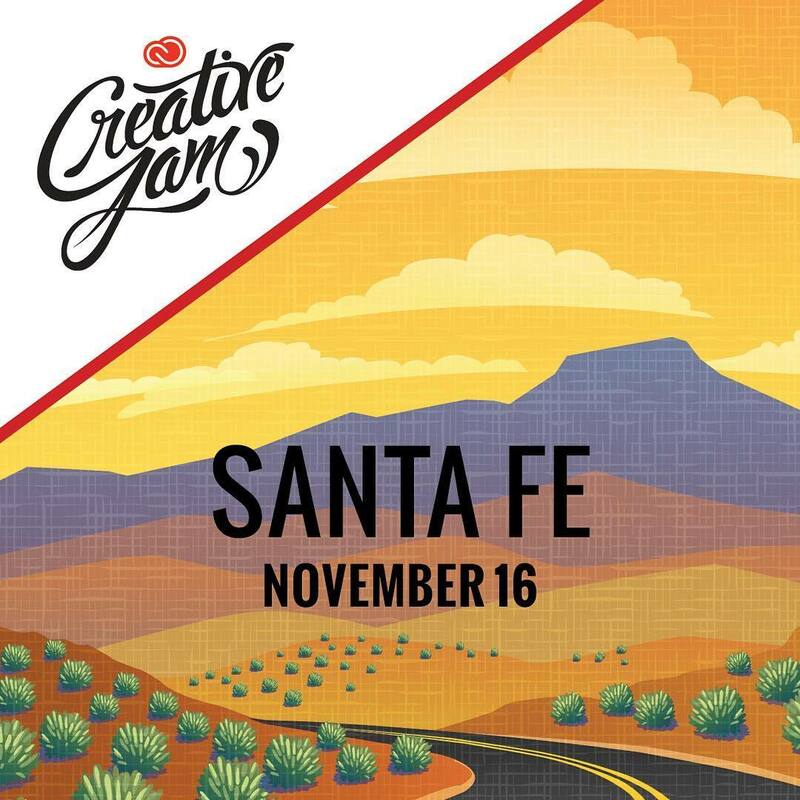 Adobe Creative Jam is back in New Mexico already! We had a blast last January when we welcomed them to Albuquerque, and now we get to do it again in Santa Fe. Come for a night packed with design, photography, talks and good food. 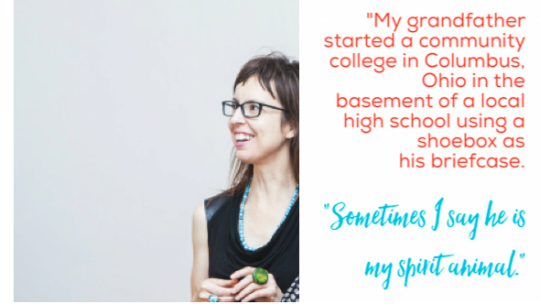 Remember when Naomi Natale spoke in March on her artistic process? Geez was that a was a good one! 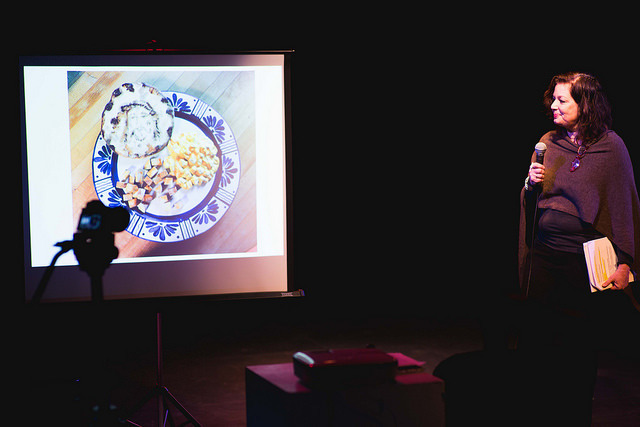 You can rewatch her talk Discovering Process filmed by Concept Flux here. Be sure to also check and see if JAK Media caught your smiling face on our Flicker album! Huge hugs to 516 ARTS for hosting us, and for being such a strong force in our ABQ creative community! 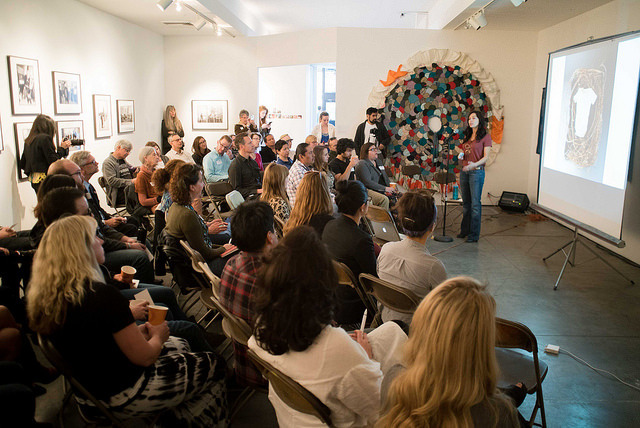 We are so grateful for our sponsors, Creative Startups, createABQ, City of Albuquerque and Flying Star for helping us make our CreativeMornings/ABQ chapter happy and caffeinated. It’s our favorite week of the month. CreativeMornings week!! 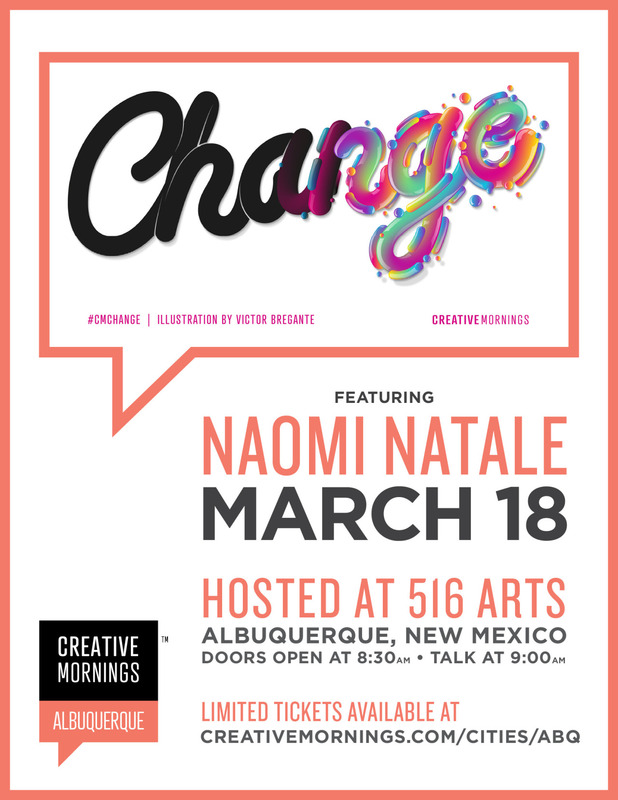 Join us on Friday, March 18th at 516 ARTS with social practice artist Naomi Natale. As always, this is a free event, but tickets are limited so RSVP so we save you a seat. Nancy Zastudil says it’s her “Protestant work ethic” that carries her through creating some of ABQ’s most interesting and well-attended contemporary art shows and gatherings. As the owner of Downtown’s Central Features Contemporary Art, Nancy curates shows that include some of the ‘Burque’s most innovative and talented artists, all of whose work she rightly identifies as “operating in the service of revolution and social progress.” So even though she doesn’t see herself as “a creative,” we all know better, don’t we? Here’s a peek into what’s shaping Nancy’s work and thoughts right now. 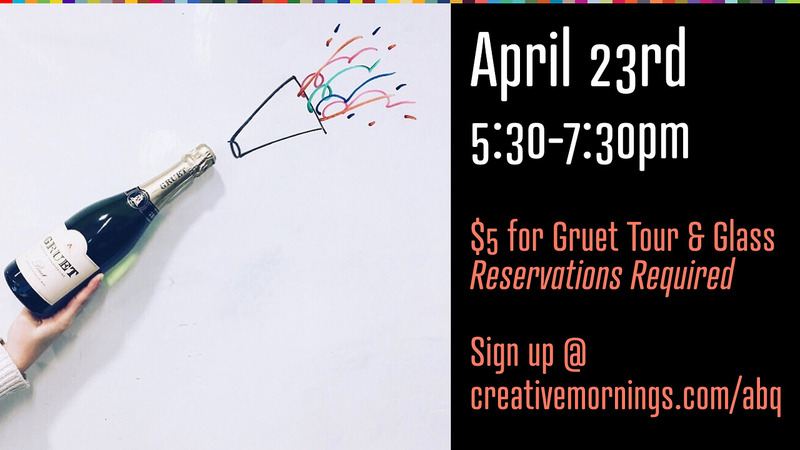 Oh, and we sure hope you’re coming this Friday’s Talk Back event, which Nancy co-produced with CreativeMorningsABQ’s own Amy Slater as part of Harwood Arts Center’s Women & Creativity month. Talk Back is an extended working lunch packed full of intentional networking and focused conversation for women in various stages of creative entrepreneurial endeavors with leading women entrepreneurs of ABQ. If you’ve ever considered starting a business in this city, you won’t want to miss it! 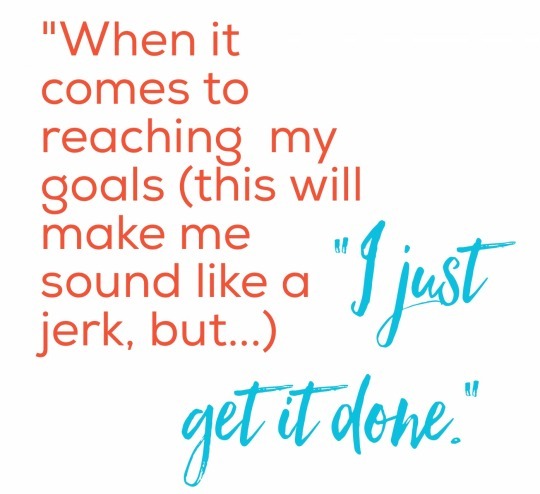 On being an entrepreneur: I was raised in a family of self-starters. My mom was always doing “creative” things, my aunt was and is active in local politics and education. My grandfather started a community college in Columbus, OH. The story goes (or at least how I remember it) that he started the school in the basement of a local high school, using a shoe box as his briefcase. He made his fortune from his passion for education, and he was also able to have a side business as an antique furniture dealer. He rode motorcycles. He traveled. He valued his family. He was generous. He was intelligent. He has an incredible laugh. He was a powerhouse. As a kid, I had no idea how much of an influence he would have on me as an adult (he died when I was in high school), but wow. Sometimes I say he is my spirit animal. I write all of this to say that entrepreneurial work is in my blood. Photos from our January shot by JAK Media are up on our Flicker! You can also watch Tey Marianna Nunn’s talk Language, Labels & Labeling filmed by Concept Flux here. Much love to Working Classroom, for hosting us! And many thanks to our sponsors Creative Startups, createABQ, City of Albuquerque and Flying Star for your wonderful support! Here it comes, morning people! 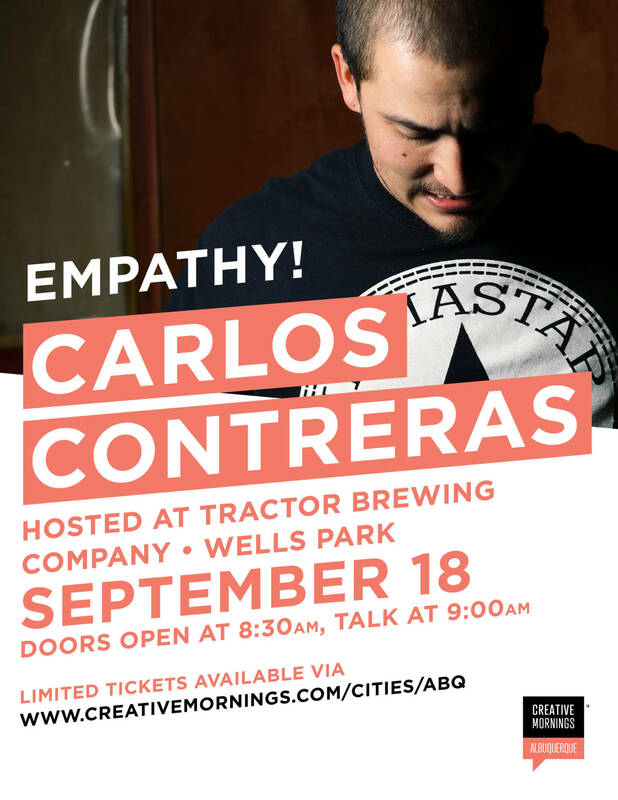 September’s CreativeMornings/ABQ is just around the corner - we’ll be at Tractor Brewing - Wells Park with the one and only Carlos Contreras. Join us on Friday, September 18th for this month’s theme, Empathy. 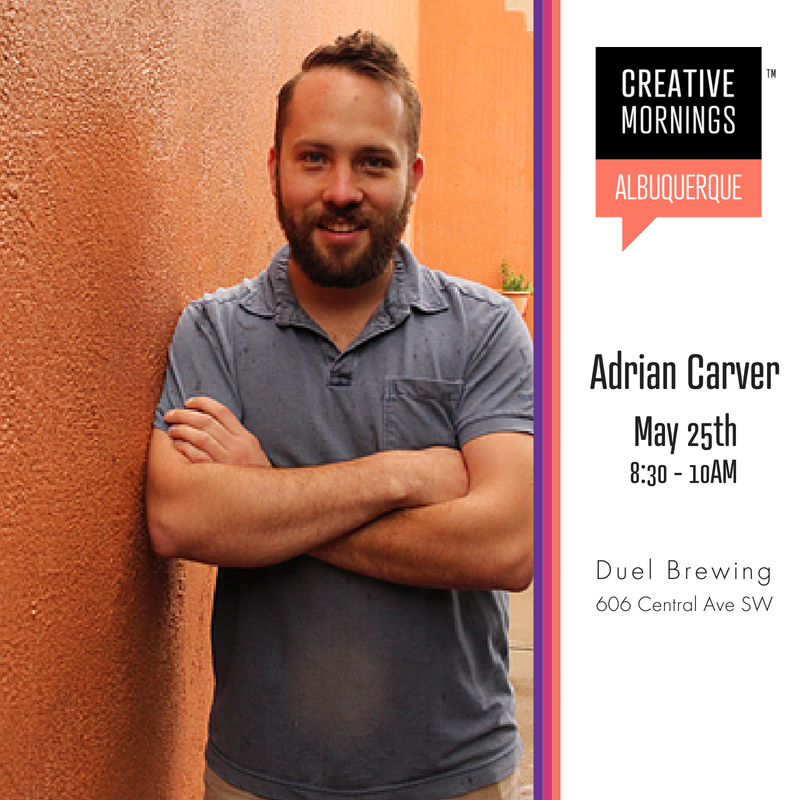 Tickets are limited - we’ll be opening up our RSVP on Monday, September 14th at 9am via www.creativemornings.com/cities/abq.